Hatters centre half Johnny Mullins is expecting a tough week in training to right the wrongs of Saturday’s 2-1 home loss against Grimsby Town. The Luton defender saw his side defeated by Omar Bogle’s double, in a display that manager Nathan Jones labelled as ‘lacklustre’. There’ll be a lot of hard work put in on the training ground and we’ll all be chomping at the bit come three o’clock next Saturday. Mullins is anticipating plenty of hard work at Ely Way to make sure they are back on form against Crawley Town this weekend though, saying: “We just weren’t at it for whatever reason, everything’s been the same, the set-up has been the same, it’s just football, if someone can answer that question, he’s a better man than me. 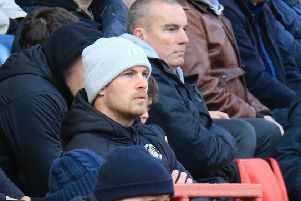 On what boss Nathan Jones had said to the side in the dressing room after Hatters dropped to third in the table, Mullins continued: “The gaffer lets us know, but I think from one to 18, we know it wasn’t good enough. Meanwhile, when asked if he had read his side the riot act, Jones said: “If I need to I’ll do that as they know what I want from them day in day out as we do stuff day in day out, but whether I rant and rave, that stays in there (dressing room). The boss was also confident that Town’s fans wouldn’t have to watch too many repeat performances after witnessing a first home defeat in the league this term. He added: “They’ve been excellent, we’ve brought a bit of credit in that way and hopefully we won’t give them too many performances like that. “We’ve bought some credit with way we’ve played and how we have played, we weren’t at our best but we’ve tried to win the game. “We had other chances where we could have finished, Isaac (Vassell) had a great opportunity, we just needed a cool head. “It would have been harsh on Grimsby as I can’t say we were the better side as they’ve had chances late on as well.